Quizz can now have as resources some questions from quizz already taken in previous phases. Times of tedious self-assessment with page refresh on save are over. Now saving an evaluation is made easy, without any page reload, allowing you to assess several exercises and several days in a row without interruption. Questions involving cursors now work on iPad! When the user wants to move on to the next phase (on clic on the blue button ), an alert message gets displayed on the screen to ask for confirmation to continue. This prevents any unvoluntary click leading to a sudden phase jump. On signup the user must choose and answer two secret questions. If you ever forget your password, you will be asked to answer these secret answers in order to reset your password. Also a unique key is generated upon signing up and used to encrypt personal notes so that nobody, not even the website's administrators, can read them. On signup you are asked to fill in a "localisation" field in order to set a timezone to your account. The platform uses it to calculate all dates rendered in the labs. You can switch timezone from your profile page while a lab is running without troubling the phases timing. The period of practice in phase 4 is maintained at 28 days, but the total duration of the phase has been extended to 31 days. This way you can review the 28 days of practice and update self-evaluations if needed. At this point you can manually move on to phase 5 or wait until the end of the 31st day to automatically go to the next phase. At the end of the 28th day, an email is sent to notify the end of the practice period. When you click on a chekbox or when you fill in a form field in a quiz, your answer gets automatically saved. Thus in case of connection loss or any other technical issue, your answers will be safe and available the next time you'll open the quiz. The auto-save is notified with . Note: there is no auto-save when you write a note or evaluate yourself in phase 4. The phase 2 is now set to last 7 days - note that it is possible to review the phase's insights even after the phase 2 is over. The phase 3 now lasts 14 days so you have time to define your exercises, for example by asking your friends. Note that these durations correspond to the maximum time allowed for each phase. It is still possible to move on to the next phase before the time runs out by clicking on the button once the required actions are performed (taking a quiz, answering questions, etc.). 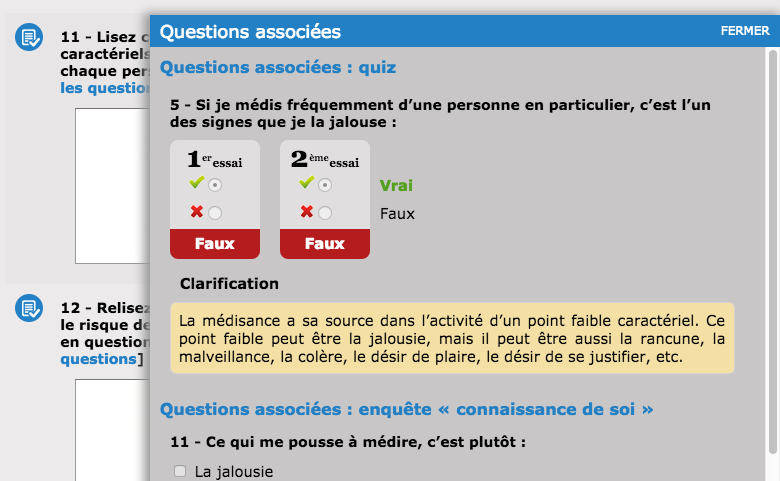 In phases 2 and 5, answers to the quiz get displayed in full without any kind of truncation. - The progress and statistics pie charts follow an orange/green color code: orange for what's in progress, green for what is actually done. In phases 1 and 5, you need to perform timed quizzes. A popup gets now displayed before you start the quiz to ensure you have planned enough time to finish it within the allocated time. Your choice of language will be remembered by your browser for your subsequent visits. However, if you switch to another browser or if you connect to the site from another device, you might have to make this choice again.